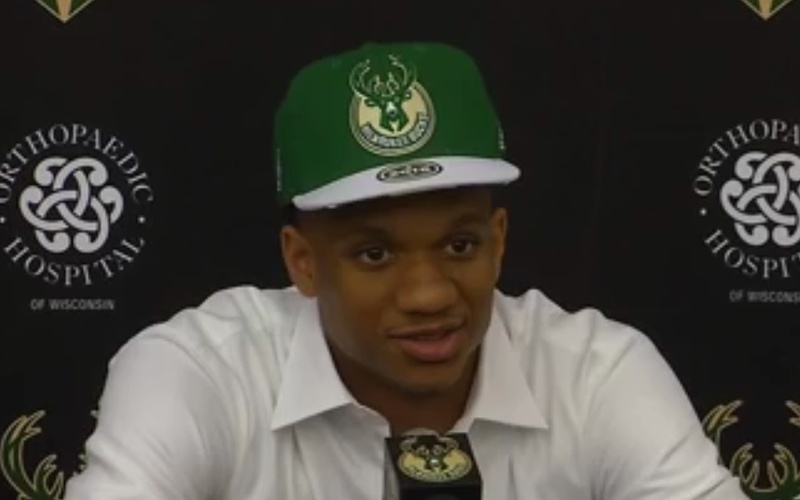 Rashad Vaughn and Chris Wood both were projected as potential first round picks in many NBA mock drafts. But only one of UNLV’s talented duo heard his name called on Thursday night at Barclays Center in Brooklyn, N.Y. The 6-foot-6 Vaughn, the Mountain West Conference’s Freshman of the Year after averaging a team-high 17.8 points in 23 games, became the 15th Runnin’ Rebel to be selected in the first round when the Milwaukee Bucks used the 17th pick to chose him. Meanwhile, the 6-foot-11 Wood joined the likes of Khem Birch and Roscoe Smith as UNLV forwards who went undrafted after leaving school early. Ironically, it was Vaughn, who was selected two picks after former Findlay Prep teammate Kelly Oubre (Kansas) was picked by the Atlanta Hawks (and later traded to Washington), who was mocked by some on social media for departing UNLV after a freshman season that ended with surgery for torn left meniscus in February. But Vaughn, one of the top perimeter shooters in college basketball and still just 18 years old, began shooting up draft charts once he became healthy enough to take part in workouts for NBA clubs. A Los Angeles workout organized by agent Sam Goldfeder and Excel Sports Management caught the attention of number of NBA teams desperate for a shooting guard and a Monday workout in Milwaukee sealed the choice for the Bucks. “Rashad shot the ball extremely well in that (Los Angeles) workout,” Bucks’ General Manager John Hammond told the Milwaukee Journal Sentinel “I think he got a lot of people’s attention there. Then he was in our last workout here on Monday and shot the ball extremely well for us again. So much so that the Bucks passed on local favorite Sam Dekker of Wisconsin who was picked next at No. 18 by Houston. Vaughn, a native of Minneapolis, watched the draft with about 250 friends and family at Seven Sushi Lounge in Minneapolis. Meanwhile, Wood suffered through watching the draft at Fizz Lounge at Caesar’s Palace. The only other Mountain West player to be picked was Wyoming’s 6-foot-9 Larry Nance Jr. He was picked 27th overall. Wood averaged 15.7 points and 10.0 rebounds per game as a sophomore. He can take some comfort in the fact that another former UNLV big man, Joel Anthony, also went undrafted in 2007 but went on to play on a pair of NBA championship teams in Miami. He eventually garnered a five-year, $18 million contract.